How much does it cost to travel to Taipei? How much money will you need in Taipei? NT$2,362 ($77) is the average daily price for traveling in Taipei. The average price of food for one day is NT$440 ($14). The average price of a hotel for a couple is NT$2,746 ($89). Additional pricing is in the table below. These average travel prices have been collected from other travelers to help you plan your own travel budget. How much money do I need for Taipei? Few cities in the world are full of more diverse opportunities than the cultural crosshairs city of Taipei. As the capital of Taiwan, this 300-year-old city is the financial, cultural and governmental center of Taiwan. Located in the northern part of the island between the Yangming Mountains and Central Mountains, this city of 2.6 million people is always ready to welcome more visitors. While English is taught in all Taiwanese schools, don't expect everyone to be fluent. Most of the people of Taipei understand enough to get by, but you'll want to learn a bit of Mandarin or Minnan to make your stay a little smoother. The semi-tropical climate provides a comfortable vacation spot. The most comfortable season in the fall, and beware that typhoon season runs from May to October. Simply wandering the streets of this charming city can provide you with an entertaining experience. Taipei is a must-see destination, as it offers so much. In fact, it should be part of your 8-day itinerary in Taiwan because of it's cultural and culinary significance to the island. For the most stunning view in the city, take a trip up one of the world's tallest buildings. The Taipei 101 is a 1,670-foot skyscraper with stunning views from the observation decks on the 89th and 91st floors. One way to immerse yourself in the culture of Taiwan is to take a bus or taxi over to Muzha Tea Plantations. 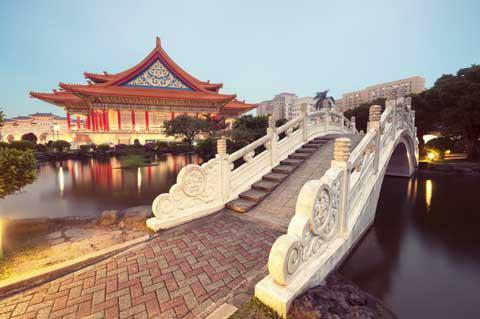 Located just outside of Taipei, this area is sprinkled with temples and teahouses spanning back centuries. Be sure to taste the local flavors and watch the teapot and tea making demonstrations. The National Palace Museum is one of the world's best. The stunning assembly of ancient art and cultural artifacts includes a collection of calligraphy, paintings, porcelain and antiques that were smuggled out of China before the Communist takeover. There is certainly no shortage of temples in Taipei. It is said that those who make weekly visits to the Hsingtian Temple ensure great career and personal success. Take your leftover snacks from your trip as your plate of food offerings. With any luck this offering will see away your evil spirits and bring you success, too. Taipei is divided into seven central districts and five suburban districts. The central districts include Wanhua. As the oldest district, Wanhua is home to historic buildings like the Longshan Temple. Zhongzheng is another central district. As the home to the presidential office, this region is the heart of the city's government. Taipei's suburban districts include Beitou with its hot springs and Yangmingshau National Park, and Shilin with fantastic museums including the National Palace Museum. Be sure to take advantage of Taipei's night markets. When the sun goes down, shop the rows and rows of food, massages, clothes and accessories. Come prepared to haggle. You cannot visit this enchanting city without taking a dip in the hot springs. With various types all over the city, you'll find springs offered by the city and some offered by hotels. Some are outdoors and some have groupings of several large baths of varying temperatures. Find the one that's right for you, and enjoy. For the adventurous traveler, there are various areas to find a trail worth tracking. The main spot is in Yangmingshan National Park. This park is full of dozens of trails including the Elephant Mountain Hiking Trail. The steep steps through a shaded hill overlook the city and give every traveler amazing views. Another amazing nearby place to visit is the hilltop village of Maokong to the south of the city. It's quite easy to take the gondola cable car to Maokong which offers some amazing views before you experience the wonders of this small town. Finally, if you want to go further out of town, consider one of these affordable day trips from Taipei. And also, check out this guide to spending 6 days in Taiwan for more information. Taipei is a city where all cultures can happily collide, and that manifests itself in its food. This region can boast one of the highest restaurant populations in the world. Every taste is represented including Chinese, Thai, Vietnamese, Japanese, Korean, Italian and more. All of these styles are available all around, even at the street carts. Be sure to try little bits of everything. Getting around Taipei is much easier than in most major cities. Their MRT (Mass Rapid Transit) system is extremely clean, efficient and reliable. The stations and trains are clearly marked in English with every stop announced in Mandarin, Taiwanese, Hakk and English. Even further, many stops have designated "safe zones" with heavy surveillance for women and children traveling at night. Simply purchase an EasyCard or day cards for quick and easy travel. The bus system in Taipei experiences the same level of ease and efficiency. Travel by taxi is the most flexible as there are always plenty available all around. Be warned, most taxi drivers don't speak English. It is a wise idea to have your destination written down in Chinese to hand to the driver. Most are equipped with GPS, and tipping is not expected. Renting a car is not recommended unless you plan to leave the city, traffic is rough and parking is a nightmare. Check out this article if you're looking for a nice hotel in Taipei. And here's more information on the best hostels in Taipei for budget travelers and backpackers.